On a recent trip to Ellis Lake, I came upon this beauty. Yesterday Jon and myself were off to Ellis Lake to track down the LeConte’s Sparrow that’s been seen there for the past several days. We hikes off to a lone patch of stunted Willow trees situated along a low channel that runs the length of a sizable field that splits everything into two. Normally this would be impassable to foot traffic, however during this dry spell we’ve had we were able to walk all the way the Willow stand. Despite working the area for more than two hours, we never came across the LeConte’s Sparrow, however it was a 8 sparrow day with both Nelson’s Sharp-tailed and Lincoln’s being sighted. 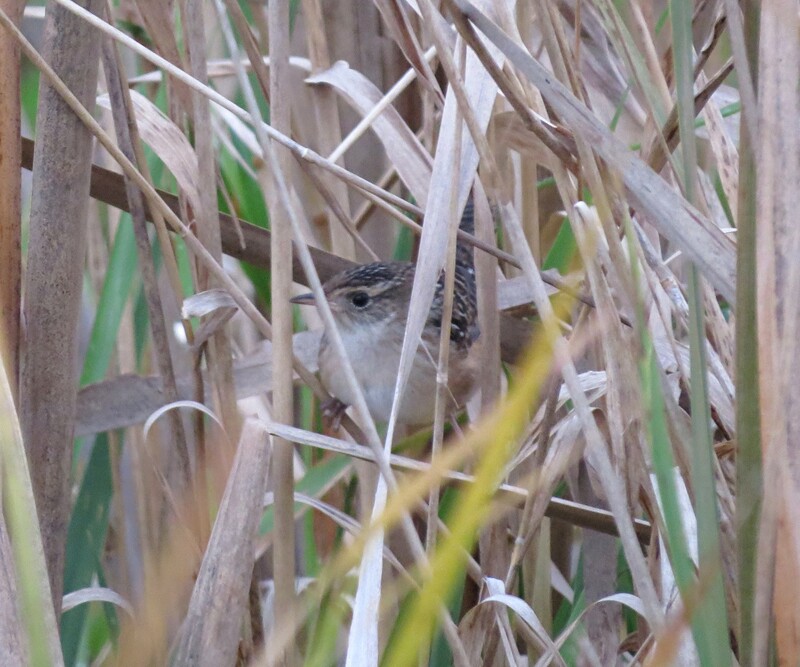 Besides the Lincoln and Nelson’s, another treat for the day was the Sedge Wren that we saw several times, usually in the Willow Stand. Always moving and never giving me a clear shot, I was able to click of a couple of acceptable photographs. What is it about bird watching that keeps us going out into the field as well as keeping our curiosity peaked? 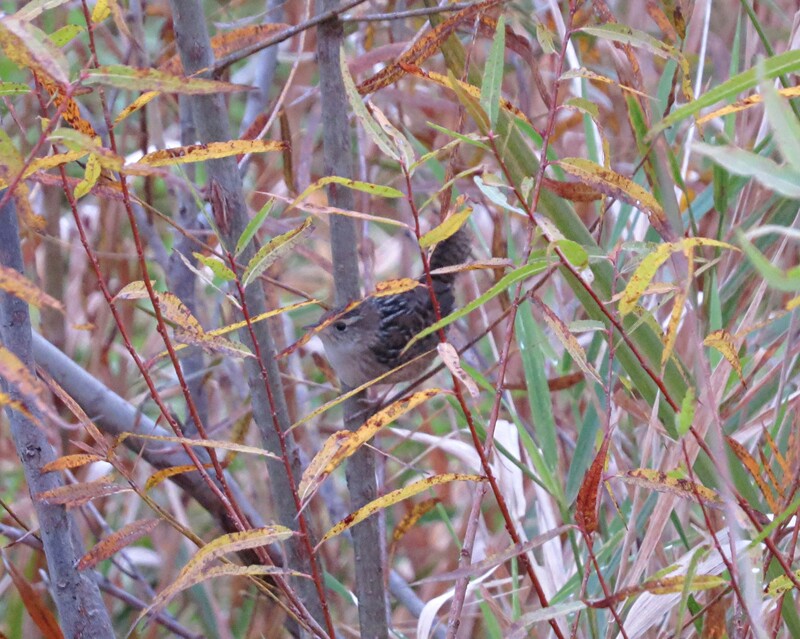 Is it the primeval instinct of being the hunter without the killing as we stalk that elusive Nelson’s Sparrow? Or is it the chase of adding another bird to your life list from a far away place? Meeting new people certainly justifies that attraction to birding. How about just getting outside after a very long, cold, snowy Winter. Spring is definitely in the air in the Ohio Valley with this last weekend, as temps soared into the 50’s with sunny skies. And as is my usual custom I dropped Jon a text about a Sunday field trip. So to get back to my original question. What is it about bird watching that keeps us going out into the field, as well as keeping our curiosity peaked? Well today it’s our Spring time visitors, the wading birds. All of those “Sandpipers” are making a big comeback with some outstanding numbers being reported. So not wanting to be left out on all this fun we decided to keep our birding adventure in the Butler County area. Last year the Cincinnati Zoo property was quite the go to spot for wading birds. The recent rains have been a blessing for this hotspot, but not yesterday. A good 30 minute scan turned up nothing but ducks, which isn’t a bad thing. But when your looking for waders you limit your time at each location till you find them. It was during our drive to Ellis Lake that we stopped at Voice of America Park for a quick drive through. Well it seems that the Butler County Metroparks has been busy with redesigning the park around. Less grasslands and more water with more ducks. We weren’t necessarily looking for wading birds here, it seemed nature to stop since we were driving by. It was pretty obvious that water wasn’t draining as fast as it usually does. 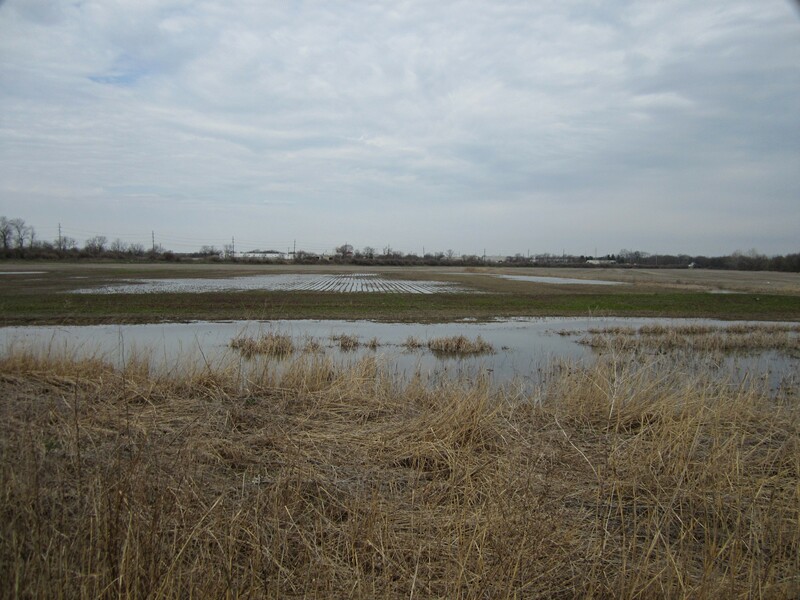 The farm field which was now reduced to just corn stubble was practically under water. And once again there were plenty of ducks to be found. We had a feeling that there had to be wading birds amongst the corn stubble, it’s just that we couldn’t locate any. That was until a Red-tailed Hawk flew over and sent the majority of the birds airborne. I was able to pick out 2 waders in the chaos of wings and feathers. But before I was to ID them they lighted, and then gone. It was a short drive to Gilmore Ponds, which was going to be our last stop for the day. Now what both Jon and myself will discuss before we reach any location is what might we find here. 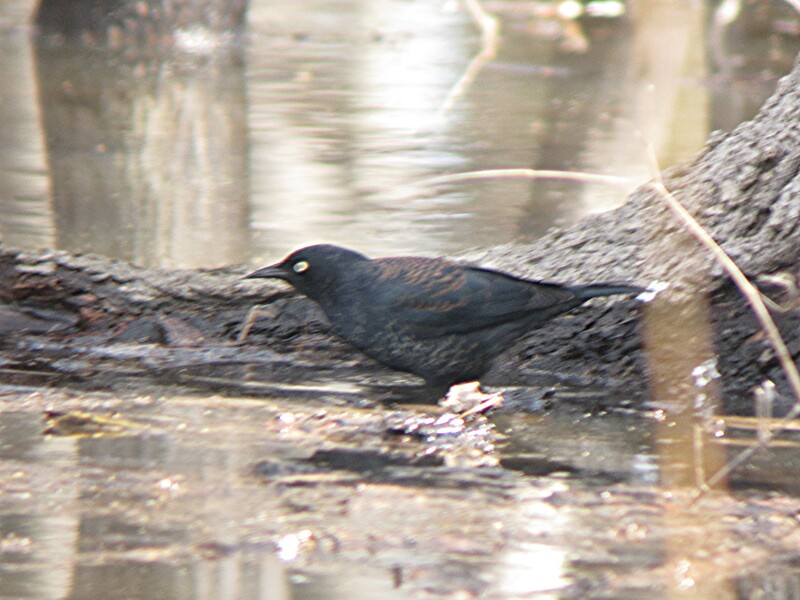 Gilmore Ponds has been a good spot for the “Black Bird” species, Rusties, Red-winged, & Grackles. 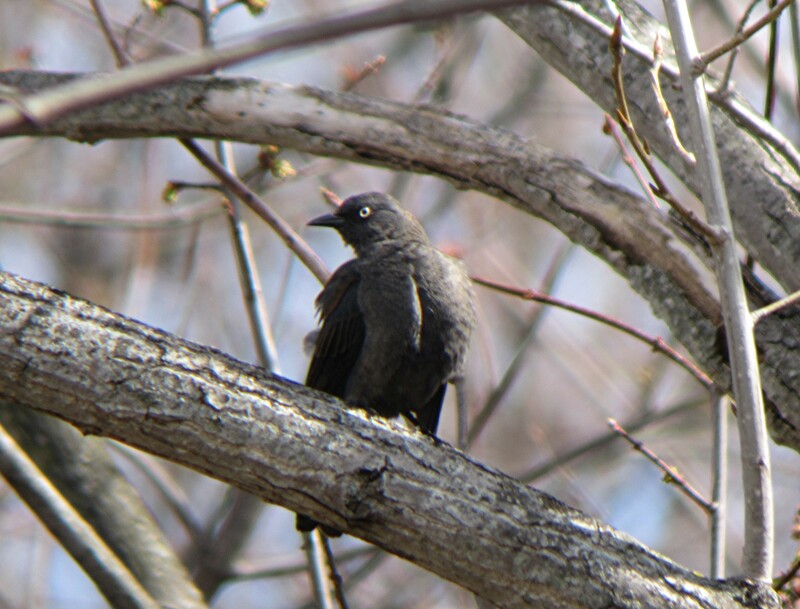 And for myself I always hold out for some Rusty Black Birds, which is turning into one of my favorite birds. Their numbers are rapidly declining due to all sorts of various reason, so finding a couple to get a photo of is always in the back of my mind. Gilmore Ponds is perfect habitat for them. It was just a few weeks ago I was there during the evening to catch American Woodcocks displaying when a massive flock of “Black Birds” came in to roost for the night. It was too dark to discern species because of darkness, but I was confident that there had to be a few. It was late morning when we arrived, and the din of birds calling filled the air. The parking lot fronts onto a flooded woodlot which covers a large area of this side of the park. 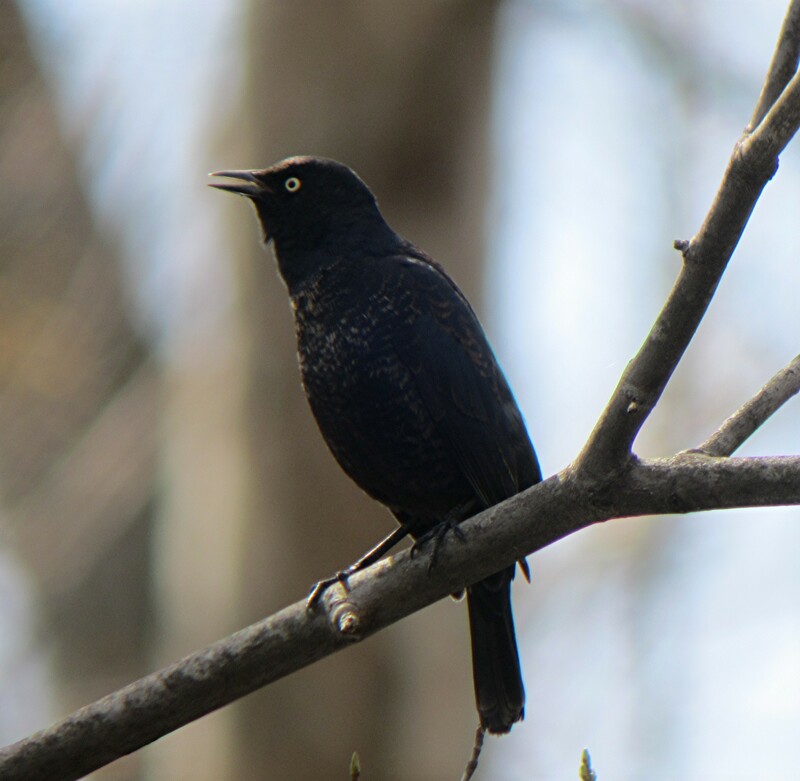 We walked about 50 yards down the trail towards the noise when we started to scan the tree tops at all the “Black Birds”. Jon immediately pointed me in the direction of this tree top that held a couple of Rusties. Then there was some more…and more…and even more! And they were foraging on the water logged ground. It was the highest concentration of Rusty Black Birds either Jon or myself have ever seen. I think the most I’ve ever seen at one time was a couple of dozen while hiking the Loveland Bike trail in the vicinity of Spring Valley Wildlife Area. Granted there were a few Common Grackles and Red-winged Black Birds mixed in, but they were hard to pick out from all the Rusties. It was a spectacular sight. We watched a awe as we tried to come up with an approximation as to how many Rusties there might be. We needed to submit the data we came up with to e-Bird and the Rusty Black Bird Blitz data base, so we had to make some educated guess. We agreed that there was probably 2 birds for every 30 square feet. So he calculated the area at Gilmore Ponds from Google Earth and came up with approximately 1,500 Rusties. Which he told me was a conservative guess. So I’ll ask myself again why do I keep going out into the field? The forecast called for rain later on today around dinner time, so with Kathy and David at work, and Ethan spending some time with a friend in Springfield Ohio, it was no better time to get some early morning birding done before the rain came. With the tremendous luck Jon and I had last Saturday at Shawnee Lookout I needed to see if the Warblers were still as plentiful. 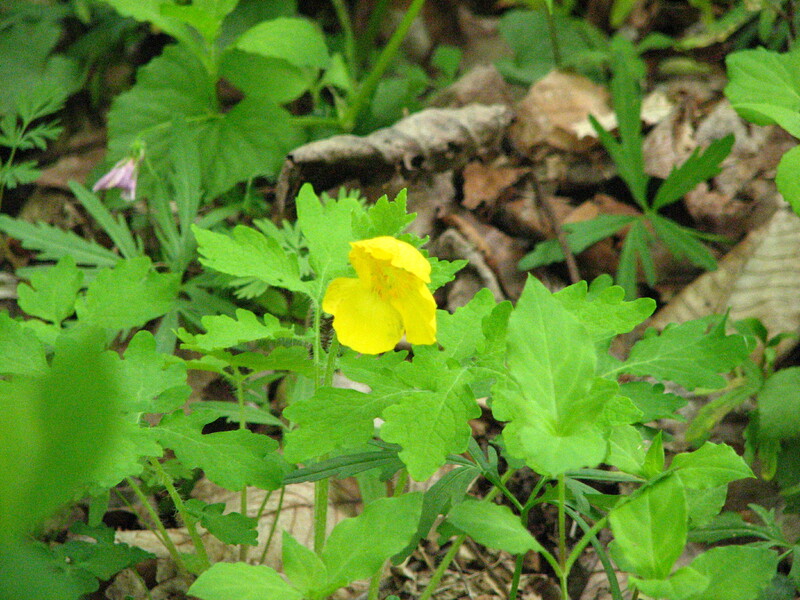 Traffic was light as I made my way down I-71 towards my first stop for the day, Magrish Riverland Preserve. Seasonal flooding can make this park almost impassable along some of the lower trails, however today the trails were open and the song birds were active as I pulled into the parking lot. And it’s from this parking lot that some of the best birding can be found. Prothonotary Warblers breed here and are always a delight as flashes of yellow catch the corner of your eye. 2 early Blackpoll Warblers were singing and giving some decent views from the parking lot as well. I meet a friend of a friend who is also a birder, so we hooked up for about 30 minutes. After which he left to take care of some work and I made my way slowly through the park and back towards my car for the short 3 minute drive to my next stop. California Woods and my hopes of catching a Louisiana Waterthrush. At 113 acres this little gem within the confines for Cincinnati offers some great birding. 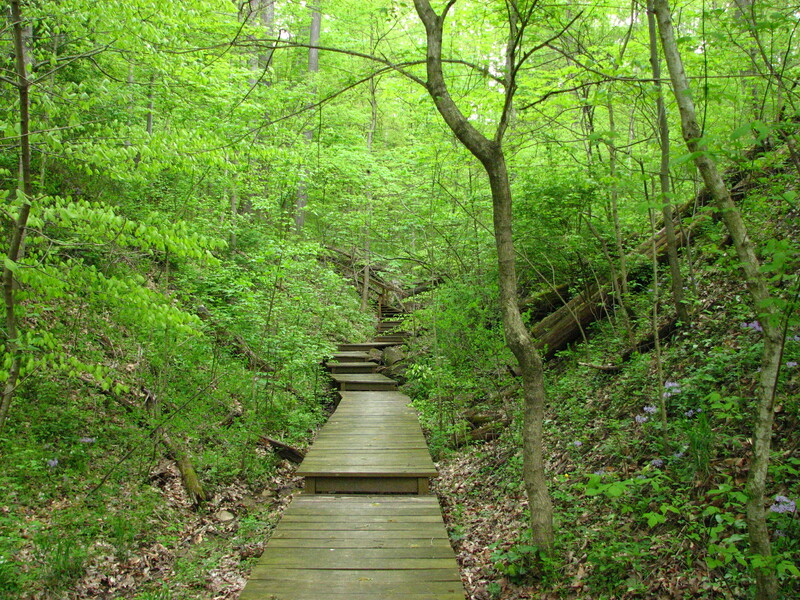 It has some very nice hiking trails and a stream which attracts the Waterthrush. I normally just stick close to the road and the stream where the most activity is. However today I decided to take a hike and enjoy the solitude of the woods. 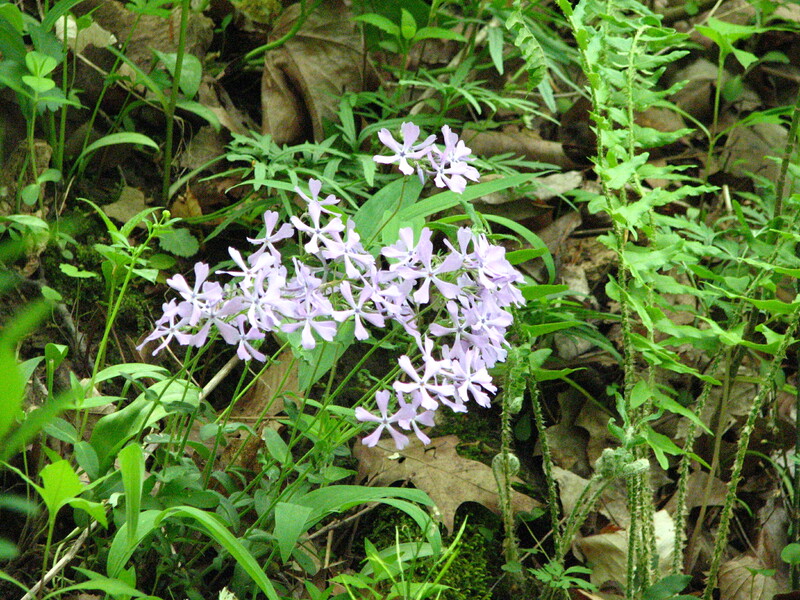 The wild flowers were in bloom as I made my way up the trail to the top of the ridge, where it winds about and then slowly descends. Vireos and Gnatcatchers were keeping me company as fewer and fewer Warblers were seen, let alone heard. The trees were really leafing out making it harder to see anything in the canopy. After reaching the bottom I started to walk back towards my car. Across from where I parked there is this small open area where birds will sometimes feed making it easier to see them. A bridge spans the stream and terminates at this open area. That’s when I heard the Waterthrush. It was staying one step ahead of me as I chased it down the stream towards the entrance to the park. It finally came to rest long enough for me to snap this poor photo. He’s right in the center with this leaf blocking it’s head. Now I’m happy. And with that recent addition to my year list it was time to head off North to my next stop, Ellis Lake. However on the way I made a quick stop at this series of small, fenced in ponds that local birders call “Fly Ash Pond”. They’re not very nice to look at and because it has a fence around might be a good thing. Who knows what could be growing in there. But it can be a hot spot for birds, and today it was for me, because out of the corner of my eye a flash of blue zipped by and perched on the fence. My first thought was Indigo Bunting. But being my lucky day it turns out to be a Blue Grosbeak. A truly sad picture, but one where you can use it to ID the bird. Happy once again with yet another new bird for the year I drove up the highway towards Ellis Lake to see if any more shore birds were there. With the afternoon wearing on and chores facing me when I get home this stop and the next were short. A small flock of Least Sandpipers were seen feeding along the edge of one of the larger sky pools that dotted the field at Ellie Lake. More wading birds were there than has been in the past few visits, so maybe things will turn around especially with this coming rain. My last quick stop was the Cincinnati Zoo Farm near my home. Yellowlegs and Pectoral Sandpipers were the only wading birds here, so after scanning the ponds for about 30 minutes I made my way home and the impending mowing of the lawn. Spring is truly in the air, and more so this weekend as temperatures reach into the 60’s and the sun warms the air. 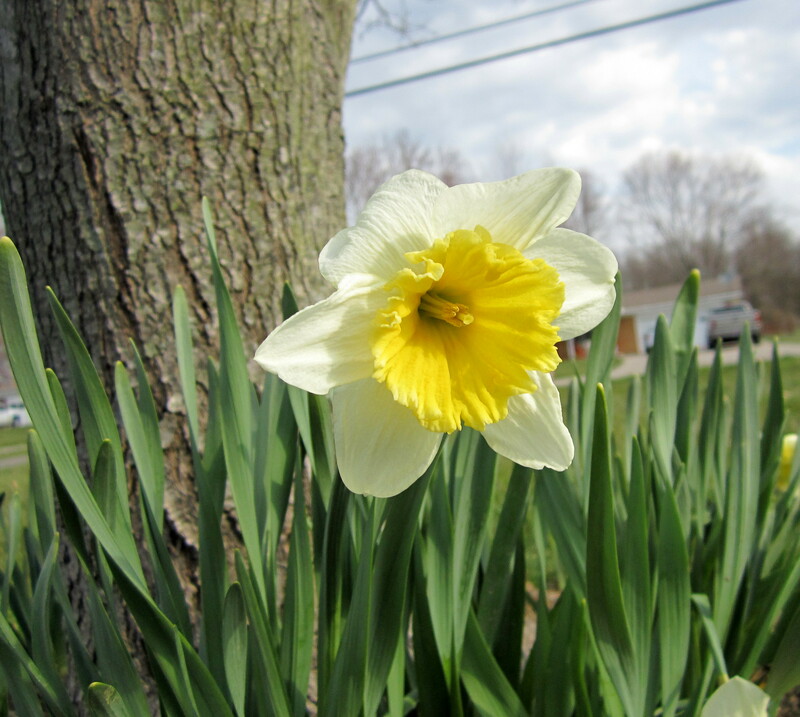 Daffodils are in bloom, and the inevitable yard work “Job Jar” is overflowing with much needed tasks to be completed. In preparation of a new mowing season, yard waste needs to be picked up. Sticks by the thousands litter the yard as left over leaves from this last Autumn pile up behind the air conditioning compressor and along the fence line. The compost bins are spilling over and need to be emptied, wheel barrel after wheel barrel load and dumped into the garden. And speaking of the garden, it needs to be tilled. Not just once, but several times to at least to incorporate the arrival of some beautiful compost fresh from the bin. And I’m still not done. And even with all this excessive outdoor activity I was still able to steal away for a few hours yesterday and get a little birding in while Kathy got her hair done. And not wanting to press my luck by going too far away, my best option was to keep it close and try to keep it as short as possible, which can be difficult considering my past history. Birders do get distracted easily you know. The Cincinnati Zoo owns this property which has become one of my favorite places to go to now, especially since it’s so close to my home. A large lot with plenty of standing water that will never be developed as long as the zoo owns the property, has been attracting some good birds lately. And I’m in the mood for some wading birds. A large group of volunteers were planting trees all during the time I was there which might contribute to the fact that I never saw any while I was there. However the Wilson’s Snipes were very active and as they foraged along the edge of one of the bigger sky pools. 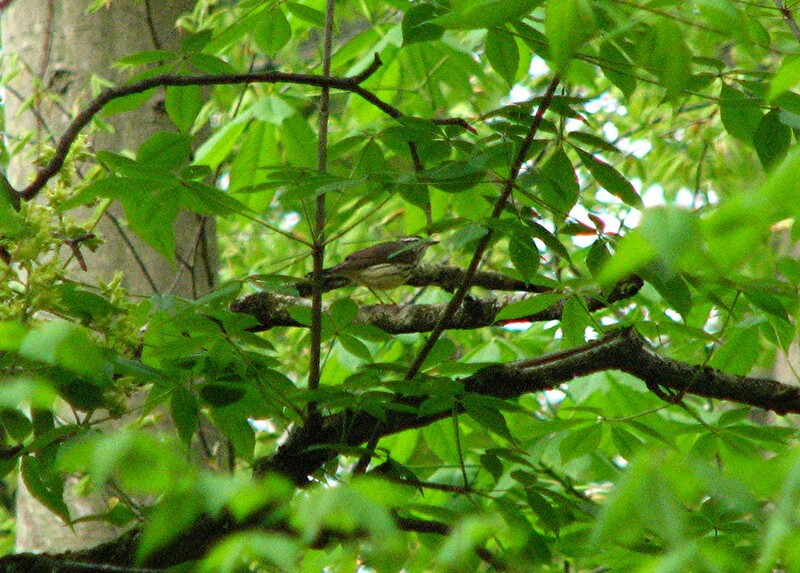 Getting a picture of these small birds, at a distance isn’t easy. If you look close he’s right in the center of the picture. Since the property is still closed to the public I was left to walk along the side of the road along the grassy edge and scan the ponds from there. Thankfully if you own a spotting scope this doesn’t become a problem. 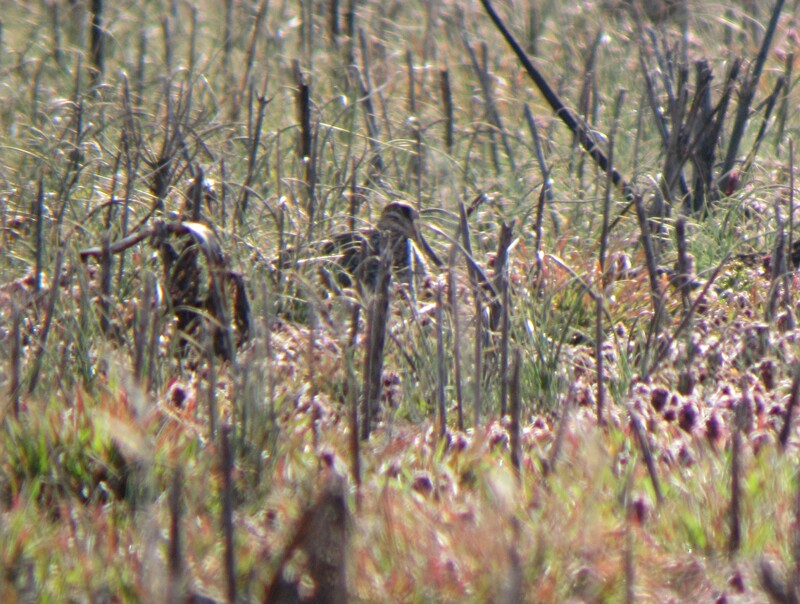 However if you were just using your bins you might be able to spot the snipe as the blended in well with the vegetation. FOS Great Egret. This was a real treat to see. I thought it might be a little early to start seeing these large wading birds, however as I got home and added my bird list into eBird it was amongst the list to choose from without going into the “rarities” list. I walked back to the bird-mobile after about 30 minutes and drove to my next destination, Ellis Lake. Ellis Lake can be a real hot spot and wanting to satisfy my wading bird thirst I was thoroughly disappointed when I started my scan of the flooded field adjacent to the lake. Now as you look at this picture you might imagine all sorts of Spotted Sandpipers, Yellowlegs, Pectoral Sandpipers and the like having a great old time feeding in such a wonderful place. Nope, you’d be fooling yourself. Other than a few Killdeer and a lonely looking pair of Mallards swimming in one of the larger pools, there was nothing in terms of wading birds. So I took some pictures instead. 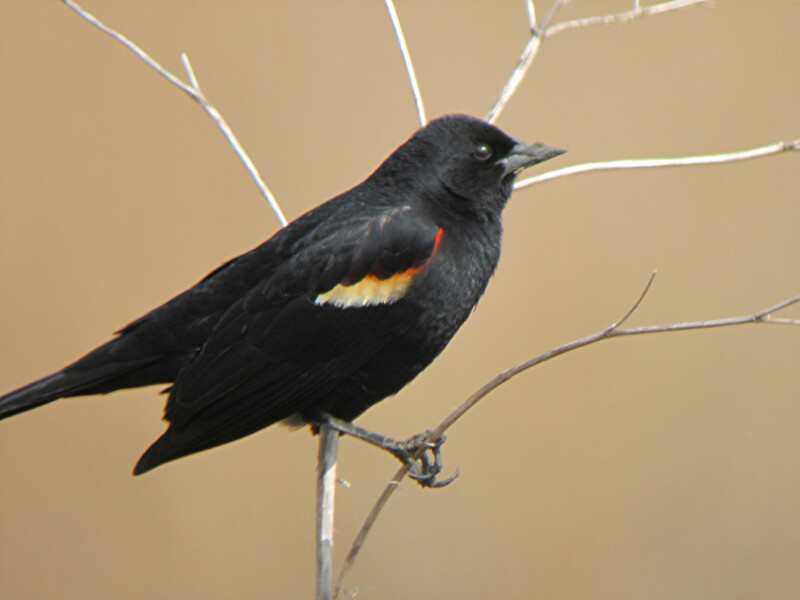 I wish I had gotten this picture of a Red-winged Black Bird focused crisper, it was a great close-up. There were both Blue-winged and Green-winged Teal present and here is my attempts at capturing these two species without scaring them off. 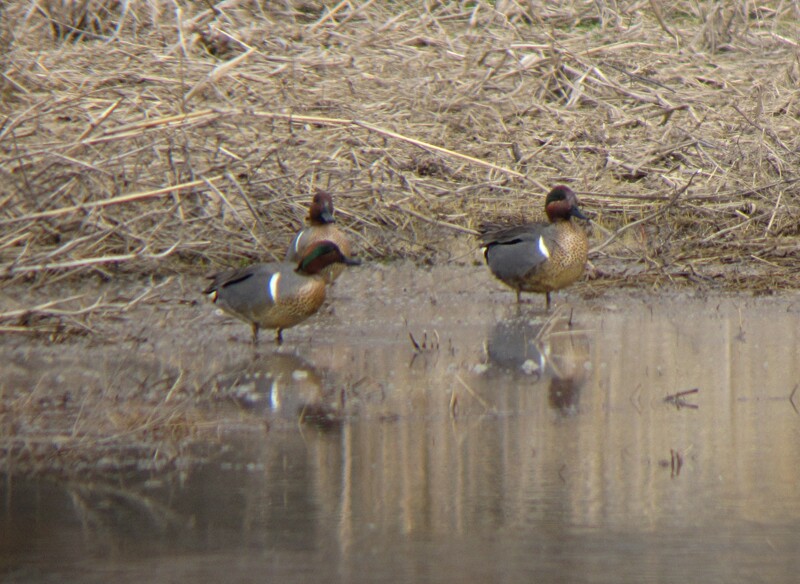 The Blue-winged Teal were feeding amongst the reeds and always had their heads down in the water. The Green-winged Teal were far away and I was having some issues with focusing. How can something so easy, be so difficult. It was a joy just to be outdoors yesterday. Even though my target birds weren’t around I’m confident that it’s only a matter of time before they show up in mass. With both of these location in such close proximity to where I live a weekly, or even bi-weekly visit isn’t out of the question. They have such great habitat for some of my favorite birds. 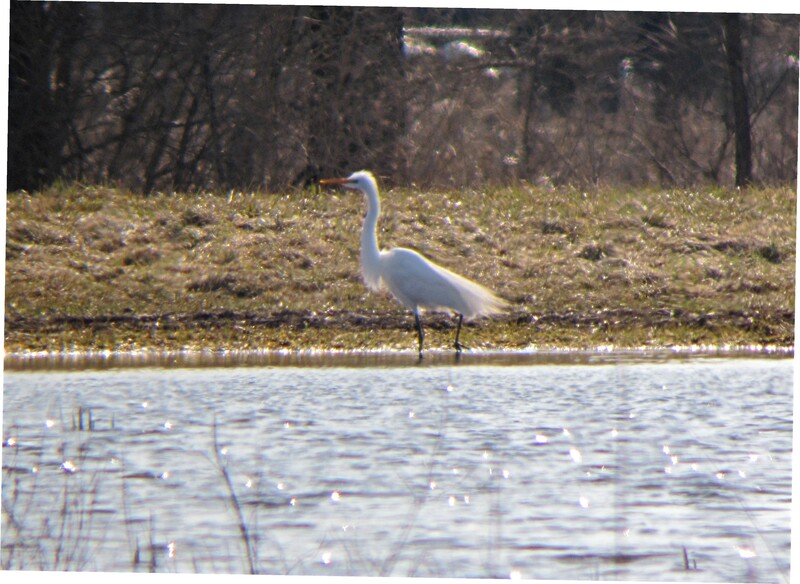 I couldn’t tell you how many times I’ve birded over in the Ellis Lake/ West Chester Wetlands area. So when I read the posting from Brian Wulker on the Cincinnatibirds sightings log that he was told of a vacant lot across the road from Ellis Lake that held some good birds I started to get that twitch. 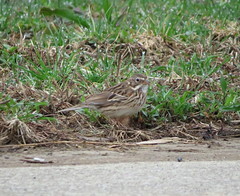 And a couple of the birds mentioned in Brian’s post were Dickcissels and Lark Sparrows. Both on my “need to get for the year” list. I “Google Mapped” the location to refresh my memory before going. The lot sits in an area where large warehouse buildings dot both sides of Union Centre Blvd. As I turned into the drive and up a small rise in the road you wouldn’t expect this lot to hold such good birds. You can’t actually see the entire field from the road. It’s not till you make the turn into the driveway for this local business till you get the full extent of the size. Looking Northwest towards Union Centre Blvd. A Red-tailed Hawk screaming, and making his presence known the whole time I was there. 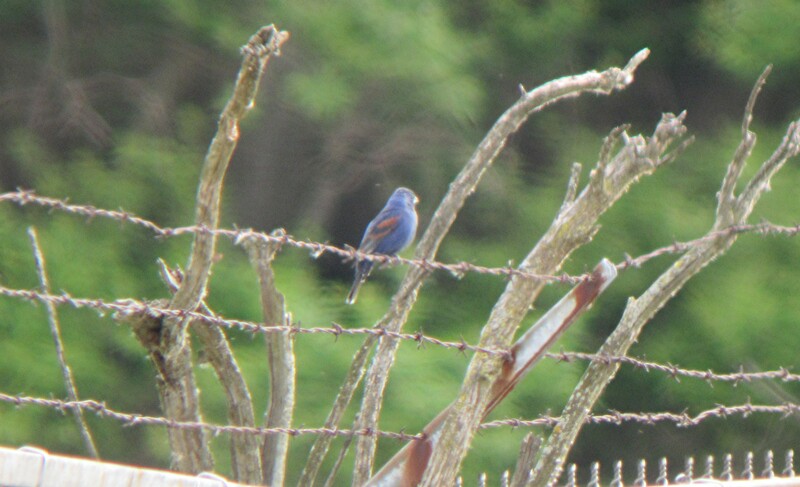 This open grassy lot was the perfect location for Indigo Buntings. Several were chasing each other around till they lighted long enough for me to snap off a picture. Dickcissel (Spiza americana) with it’s familiar yellow eye brow were abundant and very vocal. They perch on the tops of trees, bushes, or any other vegetation as they sing. This makes them pretty easy to spot in an open field such as this. 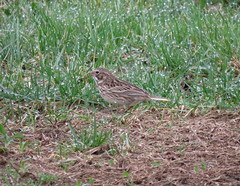 However the real star for the day were the Lark Sparrows. Chondestes grammacus is a big Sparrow at 6 1/2 inches with quail-like head markings with a single dark central breast spot. This Sparrow is like no other that it’s the sole member of it’s genus. Range maps differ as to it’s breeding range, but we seem to be in it’s far eastern range. 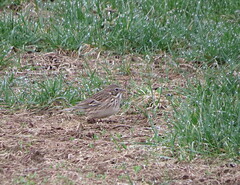 According to Ebird it’s considered a rarity for these parts. I started to hear them as soon as I pulled up and parked. Hearing them is one thing, finding them is another. They blend in so well with the undergrowth and the gravel that makes up the majority of this field. I waited and listened patiently as I noticed one just briefly scurrying along the edge where the exposed gravel meets the tall grasses. I’m getting excited now with this glimpse, so I start to pay closer attention to this area. Out of the corner of my eye I notice a LBJ fly to my left and land behind me to my left. The bird landed on the concrete curb of the parking lot and started to sing the Lark Sparrow song.There he was, out in the open, a beautiful male posing for me, and my spotting scope and camera 20 feet away. Walking back slowly so not to startle the bird, I attached the camera and got some pretty good pictures before it flew back into the field. This picture your able to see the single black spot in the middle of the breast. You have to admit that this is one beautiful bird. The markings on the head are so striking with the chestnut, black and white.